So, we have just ushered in autumn, which is when the colors of the leaves happen to change in order to have that magical look about them. Of course, with that, it also means there is one more chore that you would need to do – that is, to rake the leaves in the yard, but who bothers about raking them leaves when you are able to employ some cheap labor – in the form of your progeny? While exercise can keep a cool body nice and warm, there is another way of doing so, too, and that is through wearing the right kind of clothes. 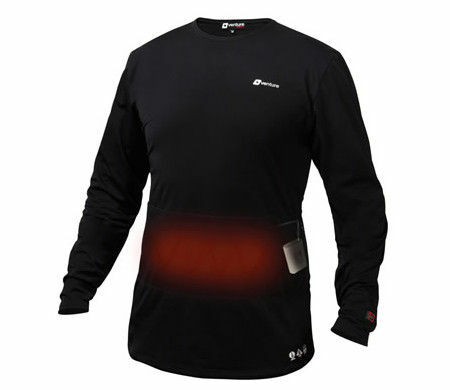 Enter the $149.95 Three Zone Heated Base Layer Top. The Three Zone Heated Base Layer Top happens to be the only battery-heated base layer top with a trio of separate zones of warmth, where it is then able to fully ensure comfort, now how about that? Perfect for taking in a cold-weather football game, or perhaps you want to be out and about to enjoy a winter’s walk, it would be unlike other bulkier garments with heating coils as well as excess insulation, due to the silky spandex base layers that rely on hair-thin micro fibers as conductors. This in turn would pave the way for a maximum range of motion without any restrictions, and when the temperature control is set to maximum, the top’s abdomen, top of back, and kidney area of the back will be able to remain toasty for up to a couple of two hours on its highest setting, and five hours on low. In fact, it takes all of just five minutes for the base layer to add a satisfying 21° increase, hitting up to a maximum of 30° above ambient temperature. This would definitely go well with a pair of heated slippers, don’t you think so?